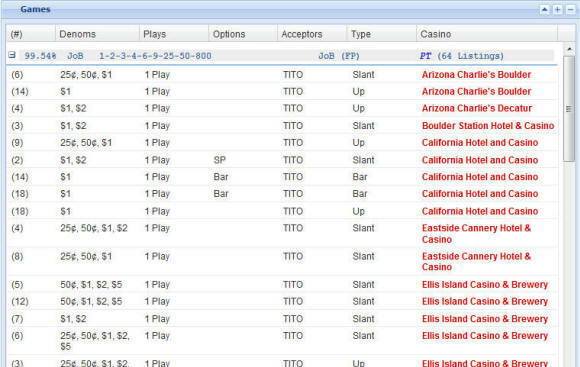 vpFREE2.com is one of the most valuable weapons in a video poker player's arsenal. The site plays host to game listings at every major (and minor) casino in the world, so you can easily find 100%+ opportunities and take advantage of them. Also, the site offers mobile compatibility so you can view their listings right from your cell phone or PDA. The first feature that vpFREE2.com offers is their casino listings. This is a database of every major casino in the world, and it lists all of the video poker games (including pay tables and stakes) that are offered at these casinos. For example, in Las Vegas alone the site lists 95 casinos and the games they offer. Just from a quick glance, I can tell you that the Aliante Station Casino and Hotel is currently offering full pay Deuces Wild at $0.25, full pay Double Bonus at $0.25, $0.50, and $1, full pay Loose Deuces Wild at $0.25, $0.50, and $1, and progressive full pay Double Double Bonus games at $0.25, $0.50, and $1. All of these games pay over 100%. It's really that easy to find profitable games. For each casino, the site also lists general information about the casino, current Player's Club promotions, user comments, and a list of hosts who work for the casino. The other way to browse the database is by selecting a specific game, and seeing which casinos offer it with the best pay tables. You can choose from over fifty games including Jacks or Better, Deuces Wild, and Double Double Bonus, and see a listing of every casino that offers that game. You can then sort the list to show the highest paying games first. You can see the casinos that offer Jacks or Better, what stakes they offer, if the game is multi play or single play, the number of machines on location, the acceptors, and the type. Basically, it gives you all the info you could ever want about the casino. One of my favorite features is the ability to use your cell phone to find games at vpFREE2.com. If you go to http://www.vpfree2.com/mobile on your cell phone/PDA, you can type in casino name and pull up the game listings for that casino. This is perfect for the video poker player who is on the go and would like to quickly find good games. vpFREE2.com may be THE most useful video poker site on the Internet, and it's completely free. There's nothing more important than playing 100%+ machines, and vpFREE2.com helps you accomplish that goal. I give them my 110% approval.